Put away your Kitchen Aid Mixer, and say good bye to the Bosch, baby. All you need for this fabulous dinner addition is a bowl, a wooden spoon, some BASIC baking ingredients, and about 25 minutes. I received this recipe from my sweet friend Julie earlier today. They sounded good (and fast) so I made them tonight to go with dinner. Did my family like them, you are wondering? “THOSE are BLOG WORTHY!” from Mark. “Make these every night.” from Emily. “Those are DE-licous….why is there only ONE left for me?” from Anna….when you play at a friends too long you miss out on the muffins. 1. Mix the dry ingredients together in a medium sized bowl. 2. In a large measuring cup combine all liquid ingredients. 3. Pour liquid ingredients over the dry ingredients and stir just until moistened. 4. Spoon into greased muffin tins. I love, love, love cooking blogs! I'm always looking for some new exciting tried and true great recipes. I'm so glad you visited my site…can't wait to try some of these!!! Thanks for making my SITs' Day so special! Angela (my sister) told me about your food blog–so fun! I can't get enough when it comes to food blogs. SO many recipes to try! I am with you, it is a constant battle to try and not be 400lbs! I am glad to find someone who loves cooking as much as I do! Such a fun hobby isn't it. I posted about your raisin bread recipe today on my blog http://www.myfoodstoragedeals.blogspot.com I added a link to your blog. Hope you get some more traffic. Great job with your blog! I use a recipe like this that I just love! It is so fast and easy; if I'm in a pinch I'll whip it up for a church bbq. Delish! 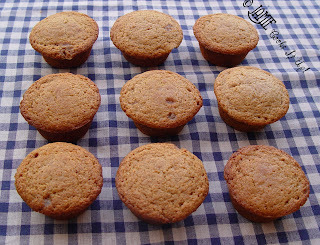 I made these yummy muffins last night for dinner. They tasted wonderful and the kids were begging for more…too bad I only made half a batch. Thanks for your kind compliments! I'm so glad you liked the sugar cookie bars…how fun for Amanda to bring them to CHURCH on mothers day! I should bring treats to Relief Society more often. That would be fun. Thanks for passing my link around. That's super nice of you and thanks for letting me know. Thank-you so much for this recipe! These muffins are amazing! I knew these were going to be good before I pulled them out of the oven though, because the batter was super delicious! These were so simple and easy and I already had all the ingredients. I served them with our dinner of homemade chili tonight, and they were fantastic. I think these muffins would be good with any meal! I am definitely going to make these again! Just thought I'd let you know I put fresh blueberries in the wheat muffins tonight. It was delicious! I made your whole wheat muffins today and they are delicioso. Every thing that I have tried on your blog has been so good. I am so glad that I found you. You're awesome! Wonderful Recipe! I added some dried blueberries for a little burst of flavor and it worked deliciously. Today, I'm going to make them again and try substituting a little applesauce for the butter to make them a little healthier. Also, I had to cook mine about 3 min longer than the recipe suggested. I have made your whole wheat muffins several times now, and they are excellent! Thanks for all the wonderful recipes on your blog. My whole wheat muffin recipe is very similar, but has only 1/2 the amount of sugar. If you're trying to cut calories, using only 1/2 cup sugar will help. These muffins have a great texture! I made them today to go along with potato, leek and carrot soup and I think they will be a great compliment. Plus, they went together so fast I feel like I could make them any day of the week. I was also thinking that if you wanted these to be sweeter, like for a breakfast/brunch item, you could also add some honey to the wet mixture. I typically have a 25% success rate with muffins. This recipe accounts for most of that 25%. Thank you so much for the easy recipe! I had to make it dairy-free for my son’s preschool class and used almond milk and coconut oil. Not as good that way, but worked very well for an easy and inexpensive snack for 11 preschoolers.